The tag 'DuPont' is associated with 11 posts. Charles Higham, author of important exposés about fascism, has passed. His work highlighted Nazi Fifth columnists in the west, including American industrialists and financiers and the 1934 coup attempt against FDR. Liberty League, industrialists, financiers orchestrated the 1934 coup plot; General Smedley Butler betrayed the plot; media suppressed accurate reportage. 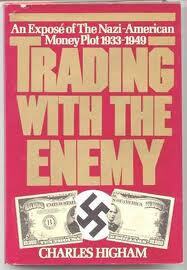 Vatican Bank, and the Vatican’s long involvement with fascism. If UN sanctions against Iraq were lifted, the price of oil might well drop below $10.00 per barrel.